Today’s Nice Price or Crack Pipe Infiniti represents such an unmemorable car that it even played the punchline to a joke in the movie Three Kings. Let’s see if that anonymity demands a less princely price tag. Crosby, Stills & Nash once ordained in song that, if you can’t be with the one you love, love the one you’re with. In practice, that advice actually can lead to a whole host of problems. I’m guessing it can also lead to mashup cars like yesterday’s 1961 Ford Falcon Ranchero/Ranger 4X4. That car/truck brings new meaning to run whatcha brung, and while the execution may have been a little off, you do have to admire the effort. Not so admirable was the car’s $6,800 asking price. That would likely have been a no brainer had the Falcon been all original and not looking like it chases Mad Max through the desert for a living. Seeing as it wasn’t and it does, it ended up with a disappointing 75-percent Crack Pipe loss. Oh well, at least now you have CS&N stuck in your head. You’re welcome. Have you ever found forgotten cash? You know, maybe a twenty in the pocket of a coat you wore bar hopping a couple of months back, or that check in the birthday card from grandma that you were meaning to cash? It’s a good feeling, isn’t it? I think it’s much the same emotion you feel when you come across some old car that you may have forgotten ever even existed. Now, I’m not talking about discovering that Pontiac sold a version of the Daewoo Matiz in Mexico years back. Ick! Nobody needs to know that and I have to admit that I’m kind of embarrassed that I happen to somehow maintain that particular snippet of knowledge. No, I mean a car that was cool enough to be remembered, but perhaps not quite cool enough that you actually did consign that memory to long-term storage. 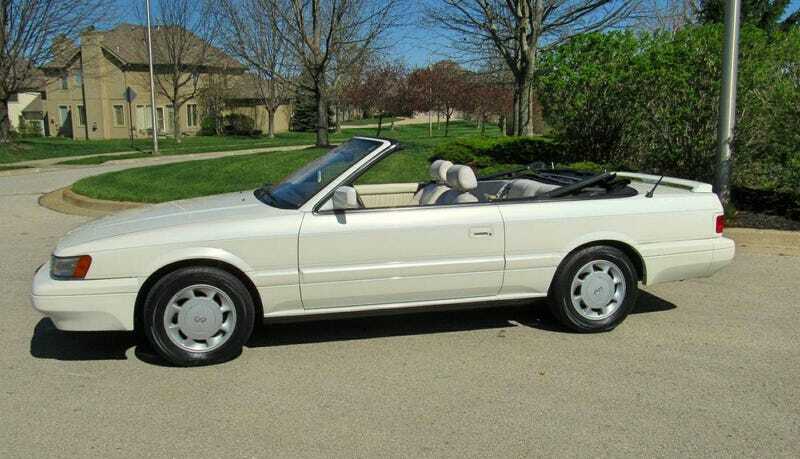 This 1992 Infiniti M30 convertible is just such a car. The M30 started life as a Nissan Leopard and was cobbled together for the car maker’s U.S. luxury brand, Infiniti, as a product line hole-filler. It was such a thinly veiled rebranding of the home market Nissan that for two years of its model run the engine cover still carried the Nissan name instead of the Infiniti logo. That doesn’t make it a bad car however, and the convertible model, offered for the 1991 and 1992 model years, was unique among the nascent Japanese luxury brand offerings for its drop-toppiness. This one, in White Quartz over sallow leather is claimed to have been meticulously maintained over the course of its life, and as well to have all features functioning as they should. Those are all admirable traits, and while we could argue about the first and third of those, the second and fourth attributes are seemingly airtight. So, just what do we have here? The M30 droptop was sold with a VG30E V6, an engine good for 162-horsepower and 180 lb ft of torque. That’s paired with a four-speed RE4R01A automatic and power is set to the rear wheels. Disc brakes and independent suspension underpin at each corner. This 132,000 mile example is said to have benefitted from a recent mechanical refreshing. That included the timing belt and water pump, brakes, axles, and tires. The seller says that the car presently needs zero dollars invested outside of its purchase price. The body is straight, and has all the pizzaz of a pair of mom jeans, or perhaps the menu at Olive Garden. The top seems to be in serviceable shape, albeit with blind spots that may give you an understanding of how Stevie Wonder feels. Inside things are a little less tidy. Overall it’s admirable in appearance, but the leather on the driver’s seat has a number of worrisome cracks and frays. It should be noted that Nissan must have sourced the leather on these cars from either Kleenex or one of those ‘it’s like wearing noting at all’ condom makers since I don’t think I’ve ever seen one of these for sale that doesn’t have some issue with the upholstery. This one’s flaws are notably minor. Original floor mats cosset your tootsies, while an aftermarket head unit—I think that’s a Jensen—holds court in the dash. In Three Kings, Marky Mark and Ice Cube’s characters engage in an ongoing debate whether or not an Infiniti convertible ever even existed. They come across an M30 in an Iraqi secret stash, and Ice of course gets proven right. Ha, silly Wahlberg. That’s probably the M30’s greatest contribution to the automotive culture narrative. It doesn’t have to be its last though. You could buy this ’92 M30 and then do great things in it. People would talk. You and the car might even get your own meme or Buzzfeed article. Who knows? To do so however, you’ll need to come up with the $4,999 asking price, and before you do that, we all need to vote on how smart or dumb that might be. What do you say, is $4,999 a decent price to drive down no-memory lane? Or, for that much would you just say forget about it? Topeka, KS Craigslist, or go here if the ad disappears. At $6,800, Could This 1961 Ranger-chero Keep You Down On The Farm? Could A First Year Q45 Still Pull $7,000?